A few weeks ago I gave a talk at a grade 8 class about my research. 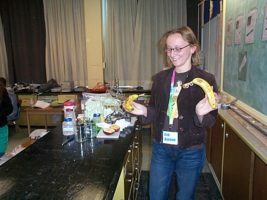 The long molecular biological explanation was out of their league, so instead I had them produce melanin using bananas. We showed that melanin needs oxygen to be formed: If you scratch in a nice yellow banana peel with a pencil, just breaking the surface of the skin, you’ll see brown appear within minutes. That’s melanin! You can try this at home, and eat the banana right afterward. The banana itself is fine, because you only damaged the skin, but if you leave it, it will rot faster than an unscratched banana. We also showed that lemon juice inhibits melanin formation by cutting an apple in half and rubbing one half with lemon juice, but not the other half. The apple takes longer than the banana to turn brown, but after an hour you can see the difference between lemoned and unlemoned. Thanks to the lovely people at AskMe I figured out that I had to use a red apple for this experiment to work best.